Premiership leaders Saracens hung on to beat Gloucester, despite playing 60 minutes with 14 men. 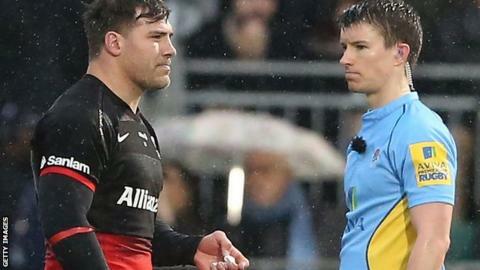 Schalk Brits saw red on the half-hour mark for a punch on Nick Wood, leaving Saracens temporarily with 13 men, Brad Barritt having been sin-binned earlier. The hosts led 13-6 at the break, Ben Ransom grabbing an early Saracens try. James Hook kicked all of Gloucester's points while Charlie Hodgson's six penalties helped Saracens bounce back from last week's big defeat by Wasps. The win moves Sarries eight points clear at the top of the table, with second-placed Exeter Chiefs facing London Irish at the Madejski Stadium on Sunday. Saracens boss Mark McCall wanted a reaction from his side following that record loss, and full-back Ransom was the man to deliver with a try inside four minutes, chipping over the defence before gathering in space to score. It was an ideal start by a north London side that included Scotland centre Duncan Taylor, who returned to club duties during the Six Nations break, although McCall was still without seven England internationals, including George Kruis, Billy and Mako Vunipola and Owen Farrell. A Barritt tip tackle on Ross Moriarty saw the hosts reduced to 14 men as he was sin-binned and, after Hook and Hodgson traded penalties, Saracens had Brits sent off. Hook reduced the deficit from the tee, but Hodgson ensured the defending champions took a seven-point lead into the break with his second three-pointer. Saracens lost scrum-half Richard Wigglesworth and prop Rhys Gill to injury late in the first half, but drove forward and piled pressure on Gloucester after the interval. The Cherry and Whites did well to resist and leave Hodgson opting to slot over another penalty. All the visitors could do at the other end was line Hook up for another penalty of his own. While Hodgson's boot delivered the win, an immense display by the Saracens pack - including replacement prop Juan Figallo, who raced to the game following the birth of his child earlier in the day - proved the difference in the gritty win. "Schalk has obviously struck him on the head, but if you look at the incident, then Schalk's knee is trapped as Nick Wood clears him out. "Schalk is almost frightened and is trying to get him off him as quickly as he can. He did the ACL on that knee last November so there was a bit of fear there. He swung to get the player off. "That was probably our best win of the season after what happened last weekend. It takes the wind out of your sails when you lose a player like that. We'd already done 10 minutes without Brad Barritt and were then playing into the wind in the second half. "It was a phenomenal effort from everybody, most particularly from our forwards." "No one is pleased with that performance. We're very disappointed with the scoreline. "For me, it felt like watching Gloucester 15-18 months ago. Our set-piece creaked, we lacked discipline in an 18-8 penalty count. You'll never win at Allianz Park with that many penalties. "Saracens, with 14 men, found a way to win the game and that's why they're a championship team." Saracens: Ransom; Ellery, Taylor, Barritt (capt), Wyles; Hodgson, Wigglesworth; Gill, Brits, Du Plessis, Smith, Hamilton, Rhodes, Fraser, Wray. Replacements: Saunders, Lamositele, Figallo, Burger, Brown, Spencer, Mordt, Bosch. Gloucester: Burns; Sharples, Twelvetrees (capt. ), Atkinson, McColl; Hook, Braley; Wood, Hibbard, Afoa, Thrush, Galarza, Moriarty, Kvesic, Kalamafoni. Replacements: Lindsay, Murphy, Doran-Jones, Savage, Rowan, Heinz, Trinder, Cook.